These baskets are handwoven from natural, eco-friendly waterhyacinth. Waterhyacint is considered as weed as it grows and multiplies rapidly causing serious problems in rivers, lakers or irrigation canals. When dried this strong material is woven into beautiful baskets. The organic S-shape of these baskets adds a modern, natural and organic look & feel to your interior. 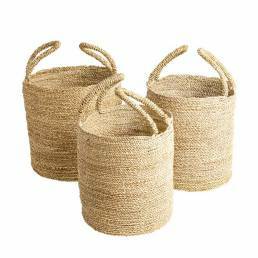 These baskets are available in the colours natural brown and black and in a set of 3 functional sizes. Use your basket for storage of textiles, fire wood or other things you may want to keep together. These baskets are an eye catcher in every room. The baskets are ethically made and sourced in small villages in Java, Indonesia. Supports a workshop in Java, Indonesia that is specialized in local natural,sustainable, raw materials for home decoration. Their village based manufacturing system allows makers to work from home on their own schedule, providing time for childcare and other duties. Through education and donations they help to raise the socio-economic status of the people in the villages. This organisation is a WFTO Fair Trade member.